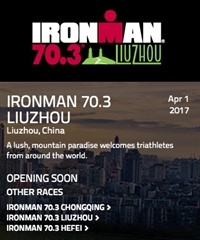 The IRONMAN 70.3 Liuzhou triathlon, will begin with a 1.2-mile (1.9 km) swim in the Liu River, located in the center of the city. Spectators will have an opportunity to watch the swim from the elevated banks of the river and a nearby bridge. Athletes will exit the water to transition next to the beautiful Panlong Mountain Park. The 56-mile (90 km) bike course will take athletes north and out of the city following the river bend before crossing west to begin the second loop. Athletes can expect incredible views as they parallel the Liu River. The 13.1-mile (21 km) two-loop run course brings athletes through downtown Liuzhou, along both banks of the Liu River, with the cityscape as a backdrop to the finish.